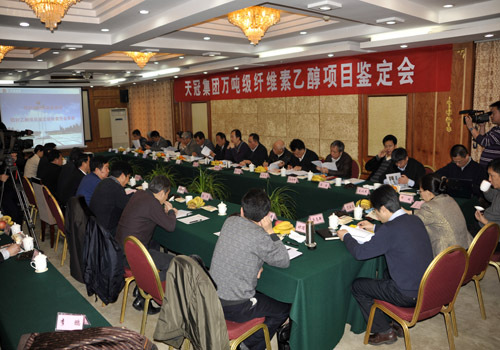 On December 21, 2011, Tianguan Group’s mega-tonnage fiber ethanol project passed the acceptance of the national-level energy technical achievements appraisal meeting. The National Energy Administration Energy Saving and Scientific Equipment Department chief Li Zhi, former chief engineer of China Petrochemical Corporation academician Cao Xianghong, Nanjing University of Technology chancellor academician Ouyang Pingkai, former minister if the Agricultural Ministry researcher Lu Ming, National Development and Reform Commission Energy Institute senior researcher Qing Shiping, Provincial Development and Reform deputy chief and energy bureau head Chang Jianhua, mayor Mu Weimin and deputy mayor He Guoying attended the meeting. On the morning of the day, relevant experts of the National Energy Administration formed an appraisal committee to carry out a technical appraisal on Tianguan Group’s mega-tonnage fiber ethanol project in Nanyang. After the panel’s field investigation, listening to academic reports and operation investigation verification reports as well as abundant questioning and discussion, the panel fully affirmed on Tianguan Group’s mega-tonnage fiber ethanol project and unanimously agreed that it passed the technical appraisal of national-level energy appraisal of science and technology and formed the following appraisal suggestion: the project’s data was integral and dependable and it achieved industrialization demonstration and the technology is innovative. The project, by giving play to the advantages, considering Chinese national conditions and sticking to local conditions and integral innovation, achieved classification and utilization of corn straw, wheat straw medium cellulose, semi cellulose and xylogen. It had reliable technology and process and nationally leading integral technology, so it possessed conditions of further industrialization and expansion. In the meanwhile, ethanol production based on cellulose is a worldly challenge, there are still many key technological problems need to be worked out, so the experts suggested enhancement of industry-university-research cooperation, deepening technical research, optimization of production process, reduction of production cost and improvement of energy utilization efficiency and economic benefits; and they suggested that the state enhance support in policies and support the cellulose ethanol production technology which could be spread and used in a large scale.